Orchids are quite capricious and demanding to care for. Inexperienced gardeners face many difficulties in growing these plants. Often to understand the causes of the ailments of plants is hard enough. Quite often, anxiety causes yellowing of the leaves or the stem. Most likely, this is natural because the aging. Thus only start yellowing lower leaves. Also change the color begins to stalk after flowering period. In this case, the sheets after drying very carefully removed, as it may hide dormant buds, they can be easily damaged. After the sheet is completely dry, it will easily separate from the plant. Yellow and withered stems are clipped with scissors or a sharp knife. Yellowing of Orchid can from change of place of "residence". They are very exacting to light, temperature and humidity regime. Changing any of these components of care may temporarily lead to plant diseases. To help him acclimate, they should try to create the most favorable conditions. For each type of Orchid. With proper care the plant will quickly regain its beauty. A fairly common cause of yellowing of plants is incorrect watering. And most often the plant is watered excessively. In this case, the roots can start to rot and the plant to turn yellow. So it is not lost, it is necessary to dry the roots for some time and to touch the substrate, which can also rot. Underfilling Orchid is much rarer, as they can easily do without moisture for long periods of time. It is very important not to overfeed orchids. Fertilizer liquid fertilizer should be no more than once a week during flowering. Now release fertilizer specially for orchids. Add them to your water when watering. Orchids are very picky about the lighting. They can not tolerate direct sun, but the lack of lighting had a most disastrous effect on their appearance. Let's see what the leaf started to turn yellow. If it is far away from the window, it really is in the lack of sunlight. When growing orchids on the North side should take care of the lighting, and on the South about the blackout. Make sure to avoid drafts. Although orchids love fresh air, the cold wind has a negative impact on their health. On the window of the Orchid lies in wait for another enemy. Is the hot air from the batteries. Besides the fact that it dries up the roots, it also reduces the humidity around the plants. To combat this, placed next to containers with water or using a humidifier. Novice growers often do not understand why their Orchid leaves begin to turn yellow. The reasons for this phenomenon quite a lot – however, as the solution to this problem. If the leaves of the Orchid suddenly turned pale, but remained dense and not dehydrated, the roots of the flower are in good condition, you may have to be the lack of power. Also it says the slowdown in the growth of plants. To solve this problem is to feed the Orchid specially designed for this fertilizers, alternating foliar and root feeding. Remember that the yellowing leaves of the plant is directly linked to the condition of its roots, and waterlogging or drying of the substrate. 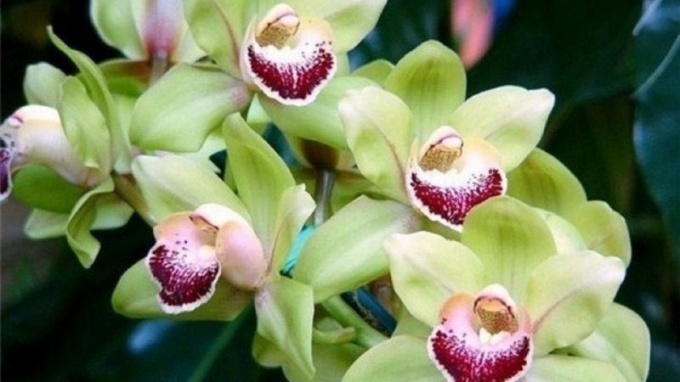 If the Orchid is affected fungal infection, its roots begin to rot, and the mold spores block the conductive vessels of the flower and quickly apply it. To save the plant, it is urgent to remove the affected roots and leaves to prepare an Orchid for replanting in a clean substrate. After planting the flower needs to handle such antifungal drugs as "Vitaros", "Fitolavin" or "Fundazol". Orchid with soft leaves, which appeared in damp spots, will also be transplanted to treat its roots. When dehydration and yellowing of the lower leaves of the orchids, whose roots remain healthy, the reason lies in the dryness of the substrate. Some owners regularly watered and sprayed plant, but water flows into the pan, and the crust stays dry. The plant begins to take the water from the old leaves, which turn yellow. To normalize watering orchids, watering it by immersion. The Orchid not water hard water because it zaaleet substrate and triggers the development of chlorosis, which is expressed in yellow-green color. When flowering orchids with yellowing leaves, its bark can get rid of excess salts with distilled water. Need to repot the plant in fresh soil and begin to feed sheets foliar fertilizers. The perfect solution in this case will be such chelated liquid fertilizer as a "bona Forte" or "Pocono". Also the yellowing leaves of the Orchid may be affected by excess sunlight, which adversely affects its photosynthesis. In this case, the plant must be removed from the window or hide in the small shadow. Another reason for the yellowing is the age of the flower. Over time, the oldest lower leaves of the orchids begin to turn yellow, but this process, unfortunately, inevitable. Obsolete leaves must be carefully removed. 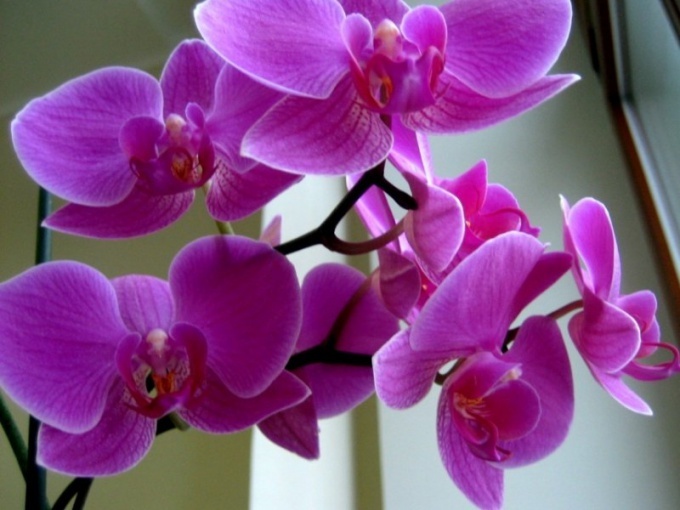 Orchid – the original indoor flower plant with a very sensitive root system. In spite of proper care leaves from time to time yellow. The most simple explanation why yellow leaves of Orchid is the death of old leaves. Some varieties (Cattleya, Phalaenopsis, paphiopedilum) over time, the lower leaf turns yellow and dries up. The orchids of the Dendrobium Nobile varieties can turn yellow or even fall off all the leaves with blooming bulbs. In these cases, the appearance of yellow leaves is due to the natural process of dying back. After the sheet is completely dry, it will fall off, and it can be removed. Optional pre-cut off the leaves starting to turn yellow. The next reason that Orchid yellow leaves – is excessive watering. 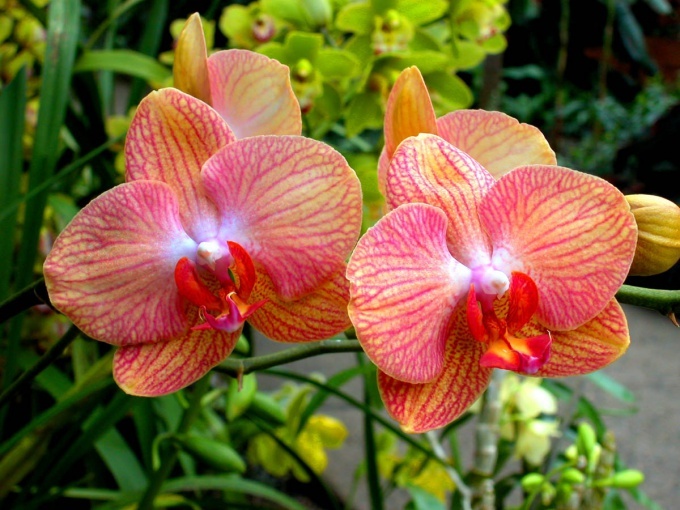 The Orchid is a flower resistant, it can withstand a long absence of moisture, and long-term intensive irrigation. However, after a few months of this kind of care the plant will need repairing. the roots of the plants blacken or become invisible through the transparent wall of the pot. If you have these symptoms, you must get a plant from the soil, inspect the roots and, depending on their condition, to carry out reconstruction activities. Yellow leaves orchids and insufficient moisture. The leaves fade, turn yellow and gradually wither. To evaluate how moist the soil is by using wooden sticks. It must be carefully placed along the walls of the pot. If after a few minutes the stick is damp, then the soil is sufficiently hydrated, but the leaves turn yellow from excess moisture. Experienced lovers of orchids can determine the soil moisture by weight – if the pot is in the hands seems easy, then it's time the plant is watered. The orchids in transparent pots with proper watering the roots of greenish mother-of-pearl, and the walls do not accumulate condensate. If the soil is dry, the plant needs water. If the leaves continue to turn yellow, you need to release the Orchid from the ground, evaluate the condition of the roots, if necessary – to transplant and to monitor watering. Yellow leaves Orchid if the plant in hot weather stands on the South or West side. The sheet gets a sunburn, the area of contact of the rays eventually turn yellow and gradually dry out, but then does not apply. It is necessary to protect the Orchid from direct sunlight. When the plant is not getting enough light, orchids yellow leaves at the base, and then die. The junction of the leaf stalk may be affected. In this case, the patient sheet must be removed and cut off the top if the stem is black. Cut places can be treated with iodine or green paint, the tools necessary to disinfect. The orchids needed potassium and iron. The lack of these elements may be another reason leaves turn yellow orchids. In this case, it need fertilizing with iron-containing compounds and potassium. If irrigation is used tap water, using peat the plant will be able to pick up iron from the water. The lower leaves of an Orchid growing without a substrate, can turn yellow from root burn. This means that the amount of salts and fertilizers significantly exceeded the norm. Water hardness is also the reason for the appearance of yellow leaves. Gradually the soil will sasalita, iron will not do the plant, the lower leaves, and then everyone else, will begin to turn yellow and fall off. In this case, the soil need to be replaced, the sheets processed by liquid fertilizers. Distilled water should be diluted with tap water in equal proportions. Proper and timely care of Orchid ensures a healthy, gorgeous bloom.